My mother and father picked my first name because apparently it was a very popular name at the time. So, therefore, in school, there were always a couple of girls with the same name as me. My mother, knowing that the name they picked was going to be a common one, decided to make the spelling of my name just a tiny bit different. So to this day, when asked my name, even though it is fairly common, for my generation at least, I say it first and then have to add, that’s with a Y. Or sometimes I just spell it out L Y N D A. But, Lynda, with a Y was just the beginning of the problems I had with my name. My maiden name is Ciafarone. That’s not an easy or common one to pronounce or spell. There are not a lot of Ciafarone’s in this country. It is not a common name. When I google the name, of course, my brothers, sisters, nieces and nephew’s names come up. But I also found this video with a Marco Ciafarone in it. I wonder if he is a relative? I found a Francesca Ciafarone’s Facebook page here. She is from the town that my grandparents are from…Pescara, Italy. Apparently she is an actor, director. I’m sure we must be related. So, when I married, my last name became only four letters. Common enough, but I still had the Lynda with a y situation going on. My current name, after my second marriage, is also one that is pretty common and easy to pronounce. But again it’s the Lynda with a Y thing. Romeo Ciafarone. I suppose after getting teased unmercifully in school, he decided that the more common name of Ray would make his life easier. Later on in life, he went back to Romeo. To tell you the truth it suited him much better than Ray. There was nothing common about Romeo Ciafarone! Names! Lots of fodder there. As for me, I love love love my last name. I reluctantly gave it up for several years due to an early marriage but the day that I knew that marriage was ending in divorce, I took iy back and vowed never to give it up again. Fortunately, RR was fine with that - as pathetic as this sounds, it could have been an issue! I don't particularly like my first name but I love the nickname that I acquired years ago. I'm with you. I love MY last name, too, and I love my middle name. But Mark? Ferggedit. I want to be M. Damien O'Neill. And how did I know you didn't like your first name, either, JT? I thought about changing my name to just Lynda Grace after my first marriage ended. No matter how many last names I’ve had, I was still always Lynda Grace. And that’s just who I am. I have a Pamela for a friend. She would get so upset if anyone called her Pamela. She wanted to only be called Pam. We are all related if one goes back far enough in the family tree, Lynda. I bet you would not have to go that far back to make a connection, with such a unique name. I like the way your mother adjusted the spelling of your name. I think that must have made it easier to be in a classroom with others with the same first name. I think I would have liked my name more if it were spelled with a "c."
I like that my name is not spelled the same as those other Linda's. But it is a pain to always have to make the odd spelling clear. If you changed your name, you would have the same problem. "That's Marc with a C, not a K."
Oh that made me laugh... "Mark with an M..."
Haha. The spelling is sooo funny. I had the same problem. My maiden name was Brown, so my mother picked Francene and spelled it differently. I don't bother correcting people. Sometimes I don't bother correcting either. Except when I have to prove my identify. I can never be found in the computer until I make the spelling distinction clear. I'm sure you are probably called Fran anyway, right? It’s probably true, my Mom wanted me to stand out a little. I like both of your names, Lucy and Theresa, with an H.
I like the name Arthur. My daughter is pregnant and seeking a boy’s name. Maybe I will run Arturo by her. My maiden name was Shawntelle Kalkbrenner. Not that difficult to pronounce, but it looked intimidating enough to confuse people. I was Shantel, Shawntelly, etc and the main issues with Kalkbrenner were that people really, really, really wanted to add an extra syllable (as though it weren't already long enough) so most often it was "Kalkenbrenner." I always joke that one of the top five reasons I married my husband was that his last name was only five letters long. My father's long-time girlfriend's name is Lynda with a "Y" and she went through a phase in her late twenties and early thirties where she spelled it with an "I" just because it was easier. Shawntelle Kalkbrenner is the coolest name ever! I love it! Rebecca (my first name isn't actually Grover) is fairly popular for my generation - there were five of us in my year at school. So I always wished my parents had chosen to spell it differently. I've often found that 'Rebecca' and 'Rachel' are interchangeable when someone first meets me and I've never understood why. Apart from the 'R' they don't look much alike! Were you ever called Becky? That is strange that people would mix up Rebecca and Rachel. As a teacher, I often come across names that are difficult to pronouce. I try to get it right but even my last name is mispronounced by some people. My husband is a retired teacher. He is pretty good with name pronunciations also. 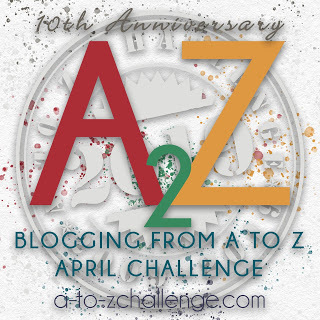 This is a great A to Z post. My last name is Csernica. Believe me, I know what you mean. My first name is very uncommon in my generation, but Lily is making a comeback among the toddlers. Lillian is a pretty name. How do you pronounce your last name. Does the Cs sound like z? Or is the s silent?